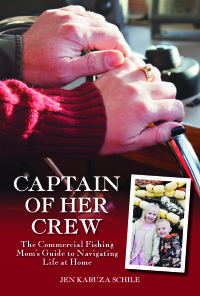 The May Issue of National Fisherman: Recognize That Guy On The Cover? 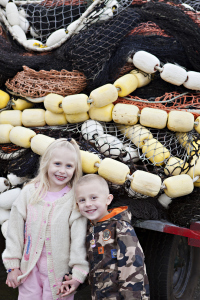 There was plenty of excitement around here for a commercial fishing mommy and her ducklings when the May issue of National Fisherman magazine showed up in the mail yesterday. Hey, that’s Daddy on the cover! 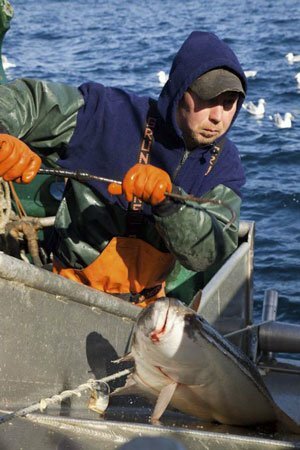 This was a photo of George taken by David Hills in the Gulf of Alaska during the blackcod/halibut season a couple of years ago. David has gone out a couple of times with the boat; once to take pictures during the longline season and once during Dungeneness crab season. I’m excited that his shot made the cover! Ironically, if you look on page four of the magazine underneath the section “10 Years Ago,” you’ll see a cover shot and profile that I wrote a decade ago on my old stomping grounds of Ketchikan, Alaska. It boggles my mind that I am seeing my cover shots and stories in that section more and more. Ten years ago…before homes, dogs, children, boats…when I traveled up and down the West Coast and Alaska taking pictures and writing stories. 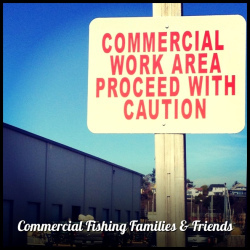 Fortunately, even if I’m currently unable to travel, the Internet has made it possible for me to keep writing and to expand into my current niche as a writer about commercial fishing families. You’ve got to be able to transition and grow and expand as a writer! Also included in the May issue of National Fisherman are two shots taken by Zed Blue, the husband of my friend and fellow writer, Robin, who blogs about her fishing family at The Fishing Blues. 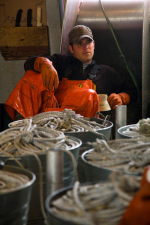 Zed took the photo on pages 18-19 of the Bering Sea crabbers, and the photo on page 20 of longlining for blackcod. It was perfect timing that this issue, with a picture of G on the cover during the blackcod/halibut season, arrived just yesterday, because he is heading north in two days to do the same exact thing. Cool send-off for the boat—and maybe, a sign of good luck and a great season ahead. 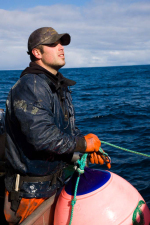 G gaffing a blackcod during the Alaska blackcod and halibut season. Photo by David Hills (www.fishingpix.net). 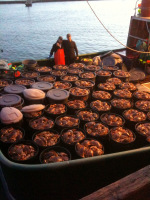 Commercial Dungeness Crab Photo Gallery is Up! 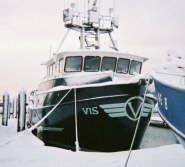 F/V Vis Dungeness Crab photos are up!! Check them out here. 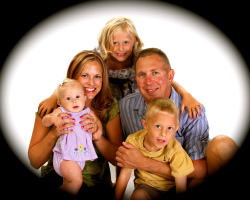 Mostly featured in the pictures is Bryan, Brett, Brandon, Steve…and one or two of George. 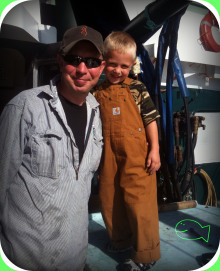 Thanks to the most awesome professional photographer of commercial fishing photos around, David Hills! It’s a new feature here on Highliners and Homecomings. Actually, it’s an old feature with a new twist. 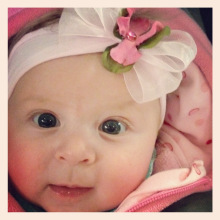 A couple of years ago I borrowed something my friend Kim does on her blog, which is create a list of my “Favorites of the Week.” I try to come up with five or so things, people, or places that struck a chord with me that week and include them in the list. I thought it would be fun to give the Favorites of the Week a new spin by giving it an official logo and creating the list each Friday. I searched around last night looking for images and I found this cute Snoopy one, which I personalized a bit. I love it! My Jazzertogs order that showed up. I love everything in it and got it all on sale. Now, if only my kids and I would regain good health so I can sport my new gear at Jazzercise next week. The AdvoCare order that arrived. I’m so excited. I just learned about AdvoCare from my friends Krissy and Sara last week and was so optimistic about it that I’m now a Distributor. More info and a link to my Distributor page later. The professional commercial fishing photographer, David Hills, arriving in Westport to board our f/v Vis to take photographs of the Dungeness crab season. His work is awesome; just check out the link to his longlining photographs in the sidebar. Sending G and the crew off. It’s certainly not my favorite thing to see G go, but the send-off was cheerful and upbeat. It is so important for fishing kids to see their mom and dad (and everyone else) staying positive and optimistic in light of departures. We waved and waved, G blasted the foghorn (a tradition started by my dad) and then we got into the car and went directly to Jazzercise to play. The unexpected check I found while sorting out presents and cards from Christmas 2009. I was shocked! I also found a couple of gift cards from Eva’s birthday a couple of years ago. I’m crossing my fingers the check is still good, lol. 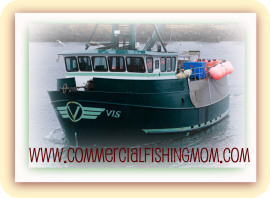 I received a nice comment and request this morning from a lovely woman named Patti who wanted to get another look at the professional commercial longlining fishing pictures I posted a few months ago. I’m posting a bit of her message here as it really made my day. Thanks, Patti! Hi Jen. Enjoy your blog. My nephew fishes in Alaska and consequently I follow the industry with great interest. The passion these boys have for the fish/crab is truly amazing. I can understand why they stay “hooked” to it. A few months back you posted some amazing pictures. They had been done by a wonderful professional photographer who really did a nice job of catching the “boys” in action on the Vis. I wanted to see them again, however now I can’t seem to find them on your blog. What is the possibility of reposting them? Or is their another way I can see them? The following is a copy of the original post from a few months back. Thanks again, Patti! 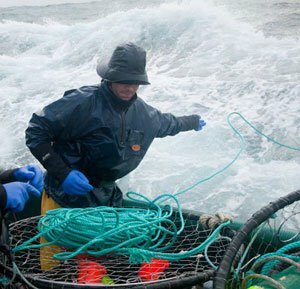 David Hills, who takes some of the world’s best commercial fishing photos, has published a gallery of the pictures he took while on board our fishing vessel last winter during round one of the Alaska blackcod and halibut longline season. If you want to see what it’s really like out there and see some extraordinary tough guys at work (including my dear husband, G, of whom I could not be more proud) check it out!! !